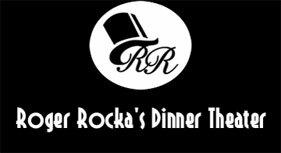 Good Company Players presents six musical comedies each year at Roger Rocka’s Dinner Theater and award-winning Chef Eric De Groot and his staff prepare a unique and delicious menu for both the served dinner and the buffet for each show. Often, the show itself will inspire some dishes that complement the mood. We strive to use the finest local products wherever possible and to offer choices that are healthful as well as flavorful, satisfying and eye-pleasing. If you have special dietary needs we will do our best to accommodate you but it is important that you call us a few days ahead so we can properly prepare for you. The office number is (559) 266-9493. 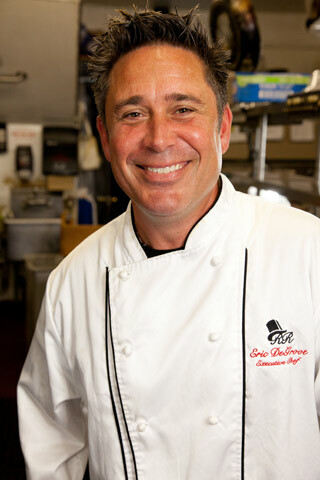 Chef Eric DeGroot started working at Roger Rockas’ Dinner Theater in 1987 as a busboy and server. He left us for a couple of years but returned again to help in the kitchen. By the mid-‘90’s Eric was Roger Rocka’s Executive Chef. Born and raised in Fresno, Eric has great respect for and makes good use of the Central Valley’s year-round harvest. He is committed to incorporating organically grown produce into his menus whenever it is available. Eric credits Chef Roy Harland and owner Sharon Alexander of Upstairs Downtown for the enormous inspiration and guidance he derived while working with them. In addition to working full-time for Roger Rocka’s, Eric creates recipes for WellPict Berries and occasionally travels to food shows to demonstrate the recipes on WellPict’s behalf. These recipes have resulted in interviews for national restaurant magazines and his work at Roger Rocka’s has made Eric very popular with local talk-show programs as well. Free samples of Eric’s fabulous cooking may be a factor in this popularity but his friends believe that his charisma and talent get the credit. Not the least of Eric’s accomplishments is his family. He lives with his beautiful wife Hannah, whom he met at the Wild Blue when she was a go-go dancer and he played drums in a surf band, the Neptunes. After they started dating, Hannah joined the servers at Roger Rocka’s Dinner Theater as well. Hannah and Eric have produced their own little organic crop — daughter Aunie and son Gavin!